The Review of Middle East Studies (RoMES) is the Middle East Studies Association’s online journal of review. 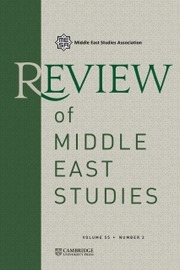 Published twice a year, each issue includes a selection of roundtables or research articles, essays, brief reports on emerging topics and issues, a pedagogy corner and discussion of online resources, and approximately forty reviews of books, films, music, software, and exhibitions relevant to Middle East studies. The focus of RoMES is the state of the craft in all fields of Middle East studies, including Islamic and cultural studies, art and architecture, performance and political studies with an emphasis on new and evolving topics and issues in scholarship, including research methods, ethical concerns, and pedagogical practice. RoMES addresses evolving contemporary dynamics, but also publishes scholarship on premodern topics of interest to a wider audience of Middle East scholars. It seeks to bridge scholarship on the region with lives, experiences and events in the region.